According to research published today, astronauts who spent prolonged periods of time in space have come back with vision problems, optical abnormalities and changes to the pituitary gland. For the study, researchers took MRI scans of 27 astronauts. They found that significant percentages of the astronauts who spent over 30 days in space had symptoms typically found in patients with intracranial hypertension. -33% of the astronauts had fluid buildup around the optic nerve. More research is needed to uncover the full effects of space travel on vision, but the news may not be all bad. The authors of this research hope that these findings may help scientists better understand intracranial hypertension originating here on Earth. The research was published in the journal Radiology. You can find more information in this press release. 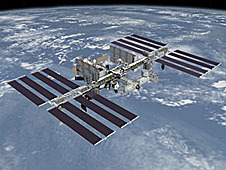 Top image of the ISS courtesy NASA.